A small bathroom does not need to make home decorating a difficult experience. 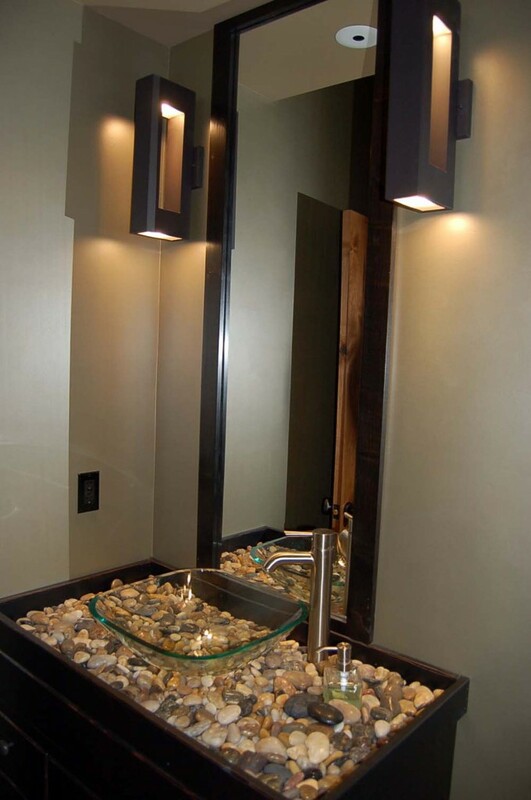 When you keep a few tips in mind, you will find many small bathroom ideas that will make decorating fun. The room will be comfortable to use, and very beautiful. You may have heard light colors make a room look spacious. While this is true, there are some ideas you may not have considered. First, you do not have to limit yourself to a white bathroom, unless it is your preference. While pastel colors look lovely in small rooms, so do brighter colors. Pale peach, blue, yellow, or pink will give your bathroom a soft, gentle appearance. Bright, bold colors can be chosen instead for a unique look. A second point in choosing colors is to include a little variety. If your walls, curtains, and and floors are all the same color, the room will appear smaller. Choosing two or three colors, or a solid color and a pattern, will add to the appeal of your new bathroom, and make it appear much larger. The furnishings you choose can enhance a smaller-sized bathroom. When you think of small toilet furniture, an above-toilet cabinet is a good choice. There are a number of points to consider when purchasing one of these cabinets. First, the right material and color can give a light, airy look to the entire room. Solid plastic, aluminum, and natural wicker cabinets will do more for your bathroom’s appearance than dark wood. Cabinets with glass or mirrored doors will also produce this effect. Second, cabinets should be useful and convenient. Make sure it is the correct height for your family members to easily access, and contains the number of shelves you want. Installing a small cabinet underneath the sink is a better option for small bathrooms than separate cabinets or vanities. They do not take extra space, and can hold all of your essential grooming items. It is a great way to eliminate clutter, so the room will always look its best. Shower upgrades can also turn a plain bathroom into something quite impressive. A shower with a sliding door is one idea. Sliding doors conserve space when they are in use, and look nice when the shower is not being used. Another idea is to install a shower that fits snugly into a corner. Corner shower units are compact and neat, requiring very little space. If you wish, you can have a sliding door shower or corner unit with towel racks installed on the door. This option means you will not need to have extra towel racks installed on your walls. Small bathroom ideas for decorating can turn it into the nicest room in your home. When purchasing decorative accents, moderation is important. Whether you would like to decorate with plants, sea shells, or other favorite objects, keep in mind that more does not add up to better. A few decorative objects will highlight the room and give it special points of interest, without appearing busy or crowded. There is nothing quite like a clean, fresh bathroom to bring comfort, convenience, and beauty into a home. Even if you have a tiny bathroom, there is no reason for it to be anything less than wonderful. It is a room you, the members of your family, and your guests will use every day. When you begin with these tips, it will be much more than functional. It will surely be the nicest bathroom you have ever owned. Whether you do all of the decorating yourself or hire someone to help, you will love the results.